In an argument, economists will concede that people seek stuff other than money, but this is rare in published papers and nearly non-existent in economic theory. Do economists have a theory of when people maximize money as opposed to other stuff (e.g., prestige)? This is stupid. Basic economic theory says that people seek to maximize utility, which is generally defined as a person's level of satisfaction. I've never seen an economics textbook that defines utility as the amount of money a person has. Economists tend to measure utility in terms of willingness-to-pay (e.g., how much would Jane be willing to pay for the prestige that comes from winning the Good Samaritan Award?). This doesn't mean that economists think people are only motivated by money, it just means that in economic models, utility is usually denominated in money. You can criticize the practice of measuring utility in terms of willingness-to-pay, if you like—there are certainly legitimate criticisms to be made. But if you think basic economic models assume that people are only motivated by money, then I'm sorry, but you fundamentally don't understand what economics is all about. This misunderstanding could be remedied by 10 minutes with Mankiw's Principles of Economics. Economists are impatient, but I'm pretty sure they'll wait. Subprime Mortgages Weren't Main Trigger of Housing Bubble. Or Were They? the considerable 2003 pullback of government-sponsored financial service corporations Fannie Mae and Freddie Mac from the credit market and their replacement by aggressive, private mortgage securities issuers. ... [I]n 2003, political, regulatory and economic factors . . . forced the two [GSEs] to significantly slow their lending volume. Private funding in the form of asset-backed securities and residential mortgage-backed securities replaced conventional, conforming mortgage-backed securities as the prevalent source of mortgage capital. The new credit environment allowed looser underwriting standards and increased tolerance for riskier, high-yield loan products. Such products included adjustable-rate mortgages with low initial “teaser” rates, Alt-A loans that did not require income verification and nonowner-occupied investor products. This borrowing climate provided previously marginal borrowers with additional access to credit. The credit market shift led to a record increase in total mortgage volume and pushed up home prices with momentum characteristic of a bubble. Huh? "Subprime mortgages" are, by definition, mortgages that don't meet Fannie and Freddie's conforming loan guidelines. If Fannie and Freddie's pullback from the credit market, and the resulting rise of mortgages that didn't meet Fannie and Freddie's guidelines, was the primary factor, then the primary factor was subprime mortgages. Now, it's possible that the authors of the study use a different definition of "subprime" (though I doubt it, since it would be incredibly misleading not to use the widely-accepted definition of "subprime" in a paper about the housing bubble). It's also possible that the article simply mischaracterizes the study's findings. Am I missing something, or does this article just not make sense? [A]s a professor, students say, Mr. Obama was in the business of complication, showing that even the best-reasoned rules have unintended consequences, that competing legal interests cannot always be resolved, that a rule that promotes justice in one case can be unfair in the next. The policy prescriptions of a lot of lawyers-turned-politicians are excessively legalistic, and therefore hopelessly ineffective: add a legal presumption here, tweak a burden of proof there, and presto!—the problem is fixed. It's good to hear that Obama doesn't think like that, and that he didn't think like that even when he was a law professor. Has anyone stopped to think about what political slogans really mean? No, Tom, you're the first. Ever. Law-and-economics theorist Richard Posner has argued that principles of consent support wealth maximization as a rule of judicial decisionmaking. According to Posner, wealth-maximizing consensual transactions are morally desirable because they promote both well-being and autonomy. In this Article, Professor West draws on Franz Kakfa's depictions of human motivation to dispute the empirical basis of both justificatory prongs of Posner's thesis. Kafka's characters, she argues, suggest that when individuals consent to transactions, they often do so because of a desire to submit to authority, and not to maximize well-being or autonomy. Thus, Professor West concludes, Posner's identification of consent as the moral justification of wealth maximization rests on an inadequate view of human motivation. To refute the empirical basis of Posner's economic analysis of law, West relied on . . . fictional stories! That's the equivalent of saying, "your analysis of human motivation is wrong because I can make up a story where humans have different motivations." These were the kinds of "intellectuals" Posner had to deal with for a long time. So I can understand if he had to dig his heels in a little too much in his advocacy of the basic neoclassical economic model. I would be very surprised to see a wholesale change in the nature of American urban development. I think the relatively laissez-faire approach of Houston may be workable when you've got ungodly amounts of land you can use, but the more you squeeze in an area, the more policies you need—and the great hope is those policies don't limit growth. New York City is a great place to be really rich and not a terrible place to be really poor, but it's a pretty hard place to live on $60,000 a year. You don't experience anywhere near the basic standard of living you would in Houston on the same income. This new paper by Ed Glaeser, Joseph Gyourko, and Albert Saiz on housing bubbles and housing supply elasticity is getting a decent amount of attention in the blogosphere today. Glaeser, Gyourko, and Saiz construct a model that predicts that there will be longer and faster house price appreciation in MSAs with less elastic supply. Their model holds up pretty well when tested empirically. I don't want to say I told you so, but . . . I told you so (see also here and here). Okay, so maybe I did want to say it. Seeing as the proxy that Glaeser, Gyourko, and Saiz used is essentially interchangeable with the strictness of land use regulations (see pp. 22-23), maybe people will take the idea that land use regulations contributed to the housing bubble seriously. If wishing made it so . . .
[I]t doesn’t follow that because state capture and political predation generally cause high levels of income inequality that high levels of income inequality cause state capture and political predation. To make that inference requires a lot of supporting assumptions, most which strike me as false. There are a variety of mechanisms through which the extent of inequality in a society might affect the character of institutions that develop. ... When political power or influence is concentrated among a small segment of the population, that group is able to shape policies or institutions to its advantage. We expect members of such elites to act in their interest, for example, by inducing the government to make investments and provide services they favor while being assessed for a less than proportionate share of the costs, or to define and enforce property and other sorts of rights in ways that treat them in a preferential manner. Some activity of this sort is present in all societies, as the distribution of political influence is never entirely equal, and those with more resources generally fare better in the competition over influencing the government. But the extent and ultimate impact of such activity can vary even across nominal democracies. [This] paper finds high inequality to be a large and statistically significant hindrance to developing the mechanisms by which economic development is achieved. These results are robust to a number of checks. ... The failure to find a significant effect of reverse causality from income to middle class share suggests that the inequality-development relationship much studied in the literature has the causality running from inequality to development. In a situation where there was relative political equality, however, economic inequality—as reflected in the relative scarcity of factor in somewhat elastic supply—might lead to institutions that greatly advantaged that scarce factor. Hence, economic inequality can sometimes ... exert more of an influence on the way institutions evolve than political inequality per se. In fact, the weight of the empirical evidence shows that the distribution of income in the U.S. closely tracks the distribution of political power, and that the causality runs from income inequality to political inequality. Larry Bartels has demonstrated that politicians are disproportionately responsive to rich voters, and not for benign reasons. Bartels found "surprisingly strong and consistent evidence that the biases ... in senators' responsiveness to rich and poor constituents are not primarily due to differences between rich and poor constituents in turnout, political knowledge, or contacting." I trust that Wilkinson wouldn't deny that in the U.S., in general, the more money you have, the more political power you have. As the historical evidence, shows, high levels of income inequality has led to the institutionalization of income inequality through state capture before. Tell me why it can't happen again. 2. Capture The concept of "capture" is poorly defined in the economics literature. In George Stigler's classic definition, capture occurs when "regulation is acquired by the industry and is designed and operated primarily for its benefits." Wilkinson seems to conflate capture with rent-seeking. Rent-seeking refers to the process of capturing the state. Just because the process of capturing the state isn't costly to the public doesn't mean that the subsequent effects of capturing the state won't be costly to the public. Industries spend their own money to capture the state; they then change the rules of the game to extract rents from the public. Wilkinson admits that capture occurs. He just doesn't think that rich people will band together to capture the state and change the rules of the game to further increase income inequality. But collective action isn't a prerequisite to capture. If just a few super-wealthy individuals band together to alter the institutions and exacerbate inequality, the result is still the same. All rich people don't need to be in on it. And if the object is to change the rules of the game to exacerbate income inequality, then the rich people who aren't in on it won't have a huge incentive to put their resources behind a campaign to oppose changing the rules. So what matters isn't the ability of the rich to coordinate; what matters is the political power of the rich relative to the general public. Once the rich have enough political power relative to the general public, we move beyond slight alterations to regulations, and into changing the rules of the game. But more importantly, once you've admitted that capture occurs, and that the rich have a greater ability to capture the state than the general public, then you can no longer claim that income inequality is benign unless it was produced by some unfair or inefficient mechanism. Now, you may say, "the solution is institutional reform, not preemptive redistribution." But my reply would be this: please tell me what institutional reform will make government immune to being influenced by money. It's never been done before in the history of the world, so while this kind of institutional reform may be the first-best option, I'm not holding my breath. In the meantime, if income inequality gets high enough that this kind of state capture is possible, then regardless of the mechanism that produced the income inequality, preemptive redistribution is justified. Like it or not, we live in a second-best world. Regarding preemptive redistribution, Wilkinson asks, "Why not suppose instead that when taxes on the wealthy rise, the wealthy become more interested in controlling the government?" This misses the point. Raising taxes on the wealthy would make them more interested in controlling the government, but the point is that it would reduce their ability to control the government. So that's my argument for preemptive redistribution. Again, I don't think U.S. income inequality is anywhere near high enough to justify preemptive redistribution. I just think that to focus solely on the mechanisms producing income inequality is to blind yourself to economic history, the empirical literature on capture, and frankly, reality. Obama’s support may help him win Iowa, but it will lead to higher global food prices and more hunger in Africa. If most or all of the agricultural trade liberalization is implemented by high-income countries, some developing countries would actually be harmed. The reason is that tariff and subsidy removal by high-income countries will tend to raise the world prices of products previously subject to these tariffs and subsidies. More importantly, Tokarick provides two separate estimates of the effects that ending farm subsidies in rich countries would have on real income in developing countries. Eliminating all farm subsidies in rich countries would, according to both estimates, decrease real income in developing countries. Under one estimate, real income in developing countries would decrease by $4.5 billion; under the other estimate, real income would decrease by $1.2 billion. Moreover, one of the studies broke it down further, and specifically estimated that eliminating only export subsidies for farmers in rich countries would decrease real income in developing countries by $1.5 billion. So contrary to what you may hear on the op-ed pages, it's not at all clear that the U.S. farm bill causes net harm to developing countries. This is NOT to say that I support the farm bill, or that the farm subsidies don't distort the market. I don't, and they do. But it's important to understand how the farm subsidies distort the market. There are important differences between awards and monetary compensation making it worthwhile to analyze them separately. The material costs of awards may be very low, or even nil, for the donor, but the value to the recipient may be very high. Internal awards (where the "donor" is the employer) don't require budgetary outlays, but that doesn't mean they're costless. When an employer gives an award like "manager of the year," it increases the recipient's value on the job market. True, it probably won't add that much to the recipient's value on the job market, but if the added value allows the recipient to credibly entertain higher-paying alternatives, the employer would have to increase his salary in order to keep him. The "material cost" of the award would thus be the amount by which the employer had to increase the recipient's salary. And if the award didn't raise the recipient's value on the job market at all, then the incentive effects of the award were likely minimal to begin with (think "participation awards"). I don't think all the incentive effects of awards are reflected in monetary compensation, as asymmetrical information probably prevents some high-incentive awards from being priced into compensation. But for the most part, awards that have legitimate incentive effects are probably fully priced into monetary compensation. In short, we are asked to worry about something that has never happened for reasons still to be coherently explained. 'Housing bubble' worrywarts have long been hopelessly confused. It would have been financially foolhardy to listen to them in 2002. It still is. That has to be unconstitutional—the government can't blithely rewrite the terms of two private parties' contract. I sometimes wish that people who don't know what they're talking about would simply refrain from talking. For providing a rigorous, detailed, and unambiguous rebuke of Naomi Klein's The Shock Doctrine. It was a truly abysmal book, riddled with logical and factual errors. Written by the simple-minded, for the simple-minded. It was disappointing that Joe Stiglitz soft-pedaled his review in the NYT. I'm glad at least one prominent liberal publication exposed it as the intellectually bankrupt work that it is. Ironically, the very success of environmental alarmism has convinced many of us that the environment is too important to be left to the environmentalists. Spoken like a true urban economst. As I will argue in the chapters to come, the tendency of many economists to offer advice based on simple rules of thumb, regardless of context (privatize this, liberalize that), is a derogation rather than a proper application of neoclassical economic principles. 3. Nudge: Improving Decisions About Health, Wealth, and Happiness, by Richard Thaler & Cass Sunstein (2007). I've never been a big fan of Sunstein (crazy overrated, especially in law schools), but I really liked this book. You can't say this about many books anymore, but it's truly original. The first 100 pages or so, where the authors lay out their case for "libertarian paternalism," is perhaps the most enjoyable hundred pages I've read in quite a while. A professor of mine in graduate school opened his Public Economics class with a half-joke: "What's the difference between liberal economists and conservative economists? Liberal economists study market failures; conservative economists study government failures." There's a grain of truth in that. In general, I think economists who specialize in market failures tend to overestimate the abilities of government, and economists who specialize in government failures tend to overestimate the abilities of the market. For this reason, I was pleasantly surprised by the remarkable even-handedness of Timothy Besley's recent book on the economics of government, Principled Agents? The Political Economy of Good Government. It's an excellent survey of the literature on the economics of government. It summarizes the current state of the field, including the empirical successes of the different schools of thought (e.g., public choice, welfare economics), and develops a useful model that incorporates the different approaches. If you want a solidly unbiased account of the modern economics of government, then I highly recommend Besley's book. To illustrate the rise of the Chicago School of economics, people often contrast Richard Nixon's 1971 statement, "We're all Keynesians now," with Bill Clinton's 1996 statement, "The era of big government is over." The former is supposed to represent the pinnacle of Keynesianism's influence; the latter is supposed to represent the pinnacle of (or at least the recognized dominance of) the Chicago School's influence. It's a neat little narrative, but is it accurate? On the macroeconomic side, the central clash was between traditional Keynesianism and monetarism. To simplify quite a bit, traditional Keynesian economists believed that policy should be expansionary during recessions, and emphasized the importance of fiscal policy in boosting short-run aggregate demand; monetarists emphasized the importance of monetary policy in the short-run, but believed that monetary policy should set a fixed rate of growth in the money supply. The Fed played around with some monetarist ideas in the early 1980s, but quickly abandoned them. Modern macroeconomics represents a mix of Keynesian and monetarist ideas. Strict monetarism has been discarded: discretionary monetary policy has been curtailed, but not eliminated. In short, we're all faint-hearted Keynesians and faint-hearted monetarists now. Clinton's 1996 statement that "the era of big government is over" didn't signal the end of Keynesian economics. Clinton's 1996 statement did, I think, signal the pinnacle of the Chicago School in microeconomics. To me, the starting point for this Chicago School was Ronald Coase's 1960 article, The Problem of Social Cost, which established the Coase theorem. Before Coase's article, the mainstream school of thought on externalities was dominated by Arthur Pigou's welfare economics. Pigou advocated government interventions to internalize externalities—most notably, taxes on negative externalities, and subsidies for positive externalities. (Hence the term, "Pigovian tax.") Coase, however, showed that under certain assumptions—most importantly, well-defined property rights and zero transaction costs—parties would internalize externalities through private bargaining, without government intervention. The idea that market failures should be remedied without government intervention is central to Chicago School economics. Coase's landmark article, in my mind, was the liftoff point for the Chicago School. This is always the way I've seen it in my head. Is my intellectual history wrong? Like a broken record, I repeat myself: A high level of income inequality means nothing in itself. I really hope Wilkinson doesn't actually believe this, because it's simply false. But browsing through his posts on income inequality, I get the feeling he really does believe it. Wilkinson is extremely bright, and clearly capable of nuanced thinking. But when it comes to income inequality he seems to inhabit the world of simple, neat models that produce satisfyingly clean answers, or what I like to call the Principles of Economics World: apply textbook economic model to issue; get answer; repeat as necessary. There are several reasons why Wilkinson's assertion is false, but here's just one: The higher the level of income inequality, the greater the chances that the richest members of society alter the institutional structure to reinforce the pattern of growing income inequality at the expense of the rest of society. In other words, a high level of income inequality means, in itself, that the society is at a greater risk of government capture by the wealthy. This is only not true if the government is completely immune to being influenced by money. To my knowledge, no such government has ever existed, and I'm 100% positive that no such government has ever existed in the U.S. Wilkinson seems to be of the opinion that unless U.S. income inequality is benign unless it was produced by some inefficient or unfair mechanism. He also seems to think that absent evidence of an inefficient or unfair causal mechanism, no policies should dare attempt to reduce U.S. income inequality. This is also wrong, for the very same reason: if income inequality is high enough to permit government capture by the wealthy at the expense of the rest of society, the high level of income inequality is inefficient, regardless of the mechanism that produced the income inequality. I think it would be extremely naïve to suggest that no areas of government policy have been captured by the wealthiest Americans (see: Bush tax cuts, 2003). And if U.S. income inequality has reached the level where government capture of income tax policy by the wealthy is possible, then it's equally naïve to suggest that income inequality is benign unless definitely proven otherwise. The housing bubble has precipitated a severe, and possibly catastprophic, economic crisis, so I thought it would be useful to put together a list of pundits and experts who were dead-wrong on the housing bubble. They were the enablers, and deserve to be held accountable. People also need to know (or be reminded of) which pundits/experts should never be listened to again. But most importantly, I have time to do this kind of thing now. The list includes only pundits and (supposed) experts. That means the list doesn't include policymakers such as Alan Greenspan and Ben Bernanke, because however wrong they may have been, policymakers—and especially Fed chairmen—are undeniably constrained in what they can say publicly. I strongly suspect that both Greenspan and Bernanke honestly believed that there was no housing bubble, but alas, we'll never know for sure. The list also doesn't include pundits/experts who were wrong only about the fallout of the collapse of the housing bubble—that is, the extent to which the collapse of the housing bubble would harm the economy. Many of the names on the list won't shock anyone, I'm sure. And FWIW, a few of the pundits seemed to deny the existence of the housing bubble simply because Paul Krugman argued that there was a housing bubble, and they absolutely hate Krugman. Unfortunately (for our economy), Krugman was right—again. "No Housing Bubble Trouble,"Washington Times (January 8, 2005): "In short, we are asked to worry about something that has never happened for reasons still to be coherently explained. 'Housing bubble' worrywarts have long been hopelessly confused. It would have been financially foolhardy to listen to them in 2002. It still is." "Recession Fairy Tales," Townhall (October 5, 2006): "When it comes to homes . . . many people have spent the last four years fretting that the 'housing bubble' might end. That is, they worried that overpriced homes might become more affordable. This is not quite as nonsensical as worrying the price of oil might fall too much, but it's close." "Mr. Hassett of the conservative American Enterprise Institute thinks housing prices will be pretty much O.K. He acknowledges there might be some bubble dynamics at play in some regions. But he argues that for the most part people are paying more for homes because their incomes are higher and interest rates are lower, reducing the cost to own a home. "Mr. Hassett expects that rising interest rates would raise this cost and home prices would then decline proportionately. But he sees no reason to expect a catastrophic decline. 'I don't think a catastrophe is very likely,' he says. "Housing Bubble?," Capitalism Magzine (May 24, 2005): "[W]hile such signs of speculation are troubling, there is little solid evidence that a real estate bubble is puffing up. "Even in places where prices are soaring, worries of a bubble could be overblown because higher prices appear grounded in good old fundamentals." "There is No Housing Bubble! !," The Conservative Voice (August 13, 2005). "Hate to Burst Your (Housing) Bubble: But there isn't one," National Review (July 5, 2006). 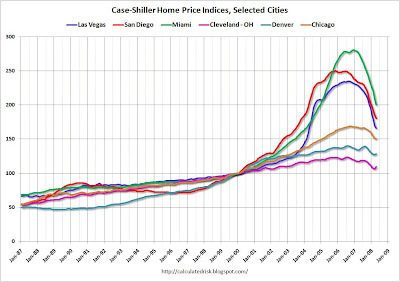 "More Than a Bubble Keeps Housing Prices Sky-High," LA Times (May 20, 2004). "House Beautiful," New York Magazine (December 8, 2003): "Housing bubble? What housing bubble? The signs are in place for a further run-up in real estate. Breathe easy, mortgage holders. There’s still no place like home." "Housing Outlook," J.P. Morgan Research, June 17, 2005 (no link): "[B]ased on what we know and see in terms of employment and interest rates, it is extremely difficult to see how five years from now we could be looking back and observing a historical 5-year growth rate of, say, less than 5%. That should be more than adequate to support the continued good credit performance of sub-prime mortgage pools. "It is important to understand — we can contemplate home price growth rates declining, albeit modestly, but we do NOT envision home prices declining!" "What Housing Bubble?," Wall Street Journal (July 28, 2005): "There is no housing bubble in this country. Our strong housing market is a function of myriad factors with real economic underpinnings: low interest rates, local job growth, the emotional attachment one has for one's home, one's view of one's future earning- power, and parental contributions, all have done their part to contribute to rising home prices. "What we do have is a serious housing shortage and housing affordability crisis." "Bubble Trouble? Not Likely," Wall Street Journal (September 19, 2005): "For the past several years, Chicken Littles have squawked that the sky -- or the ceiling -- is about to fall on the housing market. And it's tempting to believe them. "Yet basic economic logic suggests that this apparent evidence of a bubble is anything but. Even in the highest-price cities, housing is, at most, slightly more expensive than average." "Are Home Prices the Next Bubble?," FRBNY Economic Policy Review (December 2004): "Home prices have been rising strongly since the mid-1990s, prompting concerns that a bubble exists in this asset class and that home prices are vulnerable to a collapse that could harm the U.S. economy. "A close analysis of the U.S. housing market in recent years, however, finds little basis for such concerns. The marked upturn in home prices is largely attributable to strong market fundamentals: Home prices have essentially moved in line with increases in family income and declines in nominal mortgage interest rates." "So This is a Weak Economy?," Wall Street Journal (June 28, 2005): "[T]he litany against the U.S. economy is so ingrained and familiar that few disputed this spring's 'slowdown.' When strong data on income, employment, consumption and profits showed 3.5% first-quarter GDP growth and a continuation into the second quarter, the headlines shifted to other attacks -- adjustable-rate mortgages, a housing 'bubble,' the distribution of income -- rather than revising the slowdown story." Global Leaders Speakers Series (November 10, 2005): "[Forbes] maintained that there was no 'housing bubble' in the U.S. but there was an 'oil bubble' driven by speculators." "Mr. Greenspan's Cappuccino," Wall Street Journal (May 31, 2005): "These nattering nabobs expect a housing collapse to take down the U.S. economy. But excessive pessimism is unwarranted: Fears of a housing bubble are overblown." "Media Myths: The Housing Bubble is Bursting,"Business & Media Institute (Nov. 30, 2005): "The increase in real estate values the past five years has not resembled the rapid rise typically seen in a bubble." "The Housing Bubble Myth," Economist's Corner (July 2005): "When you strip away all of the white noise around a housing bubble, what you find is a robust market for housing that is undergoing several profound changes all of which manifest themselves in higher home price indexes, none of which adds up to a housing price bubble." "No Housing Bubble to Pop," Washington Post (March 2, 2005): "[T]he housing markets will cool as interest rates rise and as affordability declines, but they won't crash. Most markets will flatten for a while or increase at lower, more historical, rates. A few may decline for a year or two. But we won't have a crash." "Bubble, Bubble, Where's the Housing Bubble?," Brookings Papers on Economic Activity (2006): "Our evidence indicates that, even though prices have risen rapidly and some buyers have unrealistic expectations of continuing price increases, the bubble is not, in fact, a bubble in most of these areas in that, under a variety of plausible assumptions, buying a house at current market prices still appears to be an attractive long-term investment." "Assessing High House Prices: Bubbles, Fundamentals, and Misperceptions," Federal Reserve Bank of New York Staff Reports (September 2005): "As of the end of 2004, our analysis reveals little evidence of a housing bubble. In high appreciation markets like San Francisco, Boston, and New York, current housing prices are not cheap, but our calculations do not reveal large price increases in excess of fundamentals." "Why There is No Housing Bubble," MSN Money (June 10, 2005): "Housing bubble? What housing bubble? With the 10-year U.S. Treasury bond yielding below 4% and 30-year mortgages available at 5.1%, there isn't a housing bubble." "There is No Housing Bubble in the USA: Housing Activity Will Remain At High Levels in 2005 and Beyond," Business Economics (April 2005): "There is no evidence of a housing 'bubble' in the United States and housing demand should stay strong for years to come." "Don't be Myth-Understood," National Review (December 21, 2005): "[T]he so-called housing bubble has yet to pop, and likely won't as long as home ownership remains a tax-advantaged event. Even the New York Times — no parrot of White House talking points — has had to admit that the economy is 'booming.'" "Housing Bubble? The Market Won't Pop, Experts Predict," Wall Street Journal (April 12, 2006): "We don't see a bubble. Historically, home prices just don't go down nationwide unless we are in a significant recession. The last time home prices fell nationwide was in 1990. It's employment that really counts. The underlying fundamentals of real estate are still very positive. Job creation and household formation drive housing." "There is No Housing Bubble, Says Senior Economist," The Virginia-Pilot (January 19, 2006): "'Everybody is looking for evidence of a housing bubble,' [Vitner] said. 'There is not a housing bubble. The supply had not kept up with demand.'" "Housing bubble?," Minneapolis Star Tribune, October 4, 2005 (via LEXIS): "'There's no housing bubble,' said George Karvel, a professor of real estate at the University of St. Thomas. 'This is a media-induced frenzy. If I wanted to say there is a housing bubble, I'd have Time and Money magazine camped on my door. They've called, and I've told them there's no bubble. Panic sells." "There is absolutely nothing in any market in the country to indicate there'd be any kind of collapse in housing prices,' he said." Face the Nation (August 21, 2005): I think we do have a great deal of froth in housing markets. There's no doubt about it. I don’t think we're likely to see a large nominal price collapse, that is largely falling house prices, but I think we'll see much slower rates of growth in house prices after 2005. "Was there a Housing Bubble?," Marginal Revolution (Feb. 13, 2008): In the shift to the new equilibrium there was some mild overshooting, especially due to the subprime over expansion, but fundamentally there was no housing bubble [emphasis in the original]. "The Housing Bears Are Wrong Again," National Review Online (June 20, 2005): All the bond bears have been dead wrong in predicting sky-high mortgage rates. So have all the bubbleheads who expect housing-price crashes in Las Vegas or Naples, Florida, to bring down the consumer, the rest of the economy, and the entire stock market. "A Commercial Real Estate Crisis? Probably Not," Economix (New York Times Blog) (Feb. 4, 2009): I continue to watch the economy in 2009 but, barring a significant further decline in business activity, I do not expect to see a nationwide surplus of commercial real estate and therefore do not expect to see commercial real estate suffer the kind of crisis that followed from the housing surplus. One close call was Barry Ritholtz, who wrote a column in 2005 with the headline, "Don't Buy the Housing Bubble Propaganda." While the headline would suggest that Ritholtz denied the existence of the housing bubble, it appears to have been more hyperbole than anything. The substance of his argument was that housing values wouldn't fall in value as much as tech stocks did when the dot-com bubble popped (80%). In fact, he outright predicted a significant correction in house prices: "As the rate cycle plays out, prices will slide. I'm looking at a slow asset depreciation of 10%-30% over the next several years as a realistic possibility." Since that's more or less what has happened, it would be difficult to say that Ritholtz was "wrong about the housing bubble." Therefore, Barry does not go on the list. As I said earlier, this is a work in progress. Let me know if you know of someone else who deserves to be on the list. Barry Ritholtz lashes out at the people who caused our current mess but seem incapable of realizing (or at least admitting) that they were completely and totally wrong. Or in Ritholtz's words, the "ne'er do wells, clueless dolts, political hacks, and oh, let's just be blunt and call them what they are -- total Idiots." It's a great post. What's most frustrating isn't the lots of people made gargantuan mistakes (although that is frustrating), it's that those same people refuse to admit they were wrong, engaging instead in revisionist history and ex post rationalization of the worst kind. This is related to something I touched on a few months ago, when the fad was to blame the housing/credit crisis on the Normal Business Cycle. Instead of admitting that their stupidity got us into the crisis, people adopt a deterministic "this is just a normal business cycle" argument because it allows them to excuse their own malfeasance. That is, they can say to themselves, "It wasn't my actions that led to this recession, it was the unstoppable forces of the normal business cycle. I had no choice." The Securities and Exchange Commission announced an emergency action aimed at reducing short-selling in Fannie Mae and Freddie Mac stock, and will immediately begin considering new rules to extend new those trading limits to the rest of the market. SEC Chairman Christopher Cox said at a Senate Banking Cmmittee hearing that the SEC would institute an emergency order requiring any traders to pre-borrow stock before shorting Fannie Mae and Freddie Mac, the embattled government-sponsored entities that own more than half the nation's mortgages. It would also apply to the stocks of Lehman Brothers, Goldman Sachs, Merrill Lynch and Morgan Stanley. The order is a near-term fix and will expire in 30 days. Why not apply the rule market-wide? The old uptick rule was routinely ignored, so why would the SEC expect a pre-borrowing rule to be any different? (I haven't practiced in the banking/securities law section in a few years, so I'm out of the loop on the possible effectiveness of a pre-borrowing rule. I'm just assuming it would be as ineffective as the uptick rule.) And if the pre-borrowing rule is also toothless, why not "enforce" it market-wide? Because they are government sponsored, the government let them get away with practices that would never fly in the private market. The implicit government guarantee—which now has become explicit—thus has had serious adverse consequences. It has encouraged Fannie and Freddie management to take risks that firms subject to market competition and lacking a government safety net would never take. In particular, Freddie and Fannie have increasingly held on to mortgages rather than reselling them as asset backed securities, which exposes them to much higher repayment and other risks. Professor Bainbridge seems to think that "firms subject to market competition" would never do something as risky as keeping mortgage-backed securities on their balance sheets. This is, of course, profoundly stupid (though not at all surprising, as law professors tend to be the worst breed of market-worshipping amateur economists). All the financial houses kept MBS on their balance sheets. Bear Stearns, anyone? The idea that "market discipline" would have kept the GSEs in line is truly laughable. The market provided absolutely no discipline during the housing boom—why do you think we're in this mess to begin with? Both McArdle and Professor Bainbridge seem to think that the GSEs were out-of-control, and taking wild risks. The GSEs weren't buying or securitizing subprime mortgages though. In fact, the only thing that kept the GSEs from running full speed into the subprime market was government regulation—specifically, the conforming loan limits in their charters. I think the confusion stems from a misunderstanding of the externality that the GSEs' implicit government guarantee creates. The implicit government guarantee creates an externality because the public bears some of the cost of the GSEs' exposure to interest rate risk. Any mortgage portfolio is subject to interest rate risk. Investors use derivatives such as interest rate swaps to hedge their interest rate risk. If an investor has too much unhedged interest rate risk, creditors will demand that the investor pay a higher interest rate to compensate the creditors for their interest rate exposure. Like the big financial houses, the GSEs use an imperfect dynamic hedging stategy, which essentially hedges short-term interest rate risk but leaves long-term interest unhedged (it's a lot more complicated in reality, but that's the idea). Creditors should demand a higher interest rate as compensation for their exposure to the unhedged long-term interest rate risk, but because the government implicitly guarantees the GSEs' debt, creditors lend money to the GSEs at artificially low rates. Of course, someone has to bear the cost of the GSEs' exposure to unhedged interest rate risk, and that someone is the U.S. taxpayer. That's (more or less) how the GSEs' implicit government guarantee creates an externality, not by inducing the GSEs to take wild risks and act like cowboys. The GSEs only take on "excessive risk" in the sense that they take on more risk than is justified by their low borrowing costs. Before the collapse of the mortgage market, the GSEs were actually taking on less risk than other banks—it was still too much risk relative to their capital base and the low borrowing costs, but it was low risk nonetheless. He was a skeptic on trade before it was cool, and helped lead the fight against CAFTA. [C]ontrary to what people sometimes assert, economic theory says that free trade normally makes a country richer, but it doesn’t say that it’s normally good for everyone. Still, when the effects of third-world exports on U.S. wages first became an issue in the 1990s, a number of economists — myself included — looked at the data and concluded that any negative effects on U.S. wages were modest. The trouble now is that these effects may no longer be as modest as they were. This new orthodoxy emphasizes that reaping the benefits of trade and financial globalization requires better domestic institutions, essentially improved safety nets in rich countries and improved governance in the poor countries. With these institutions in place (or in construction), it remains safe and appropriate to pursue a strategy of “more of the same, but better:” continue to open markets in trade and finance, while strengthening institutions. For the sake of the world as a whole, I hope that we respond to the trouble with trade not by shutting trade down, but by doing things like strengthening the social safety net. But those who are worried about trade have a point, and deserve some respect. The cool new trade skeptics are concerned not with trade deals per se, but with the lack of corresponding domestic policies—both in the U.S. and in developing countries—to mitigate the negative effects of trade. By contrast, Sherrod Brown is skeptical about....well, trade in general. He doesn't say that he would support trade deals if they were coupled with domestic policies to compensate the losers from trade; instead, he opposes trade deals because he thinks they harm Americans. This stems from his belief that the purpose of U.S. trade policy is to "writ[e] the rules of globalization to protect our national interests and our communities." Brown wasn't ahead of the curve on trade in the sense that he understood the intellectual foundations of the current skepticism on trade before the newly converted skeptics. In a Roll Call op-ed (via LEXIS), Brown cited as the intellectual support for his skepticism on trade William Greider's book, One World, Ready or Not: The Manic Logic of Global Capitalism, which Brown praised as "remarkably prescient." Greider's book, if you'll remember, was widely mocked for its mindboggling naïveté and patently false analysis. Brown was wrong on trade in the '90s, and he's still wrong on trade now, just less so. Not surprisingly, Freddie Mac successfully completed its debt auction this morning (it was only a $3 billion issue). But the spreads are still pretty high. The spread over Treasuries for Freddie's 3-month note was 71bp, and the spread for the 6-month note was 48bp. The spread over LIBOR narrowed a bit at 48bp. Of course, the real action today will be in the repo market. But still, after the Treasury and the Fed's actions last night, I'm somewhat surprised that the spreads didn't narrow more. These are truly wild times on the financial markets. Full statement from Hank Paulson here. Press release from the Fed here. The Wall Street Journal has the most detailed account. In short, the GSEs will get access to the discount window, and the Treasury will seek Congressional approval to (1) further extend the Treasury line of credit to the GSEs, and (2) buy an unspecified amount of equity in the GSEs "if needed," and (3) give the Fed a "consultative role" in setting capital requirements and other unspecified "prudential standards" for the GSEs. This seems to be a 2-prong plan. First, the GSEs get access to the discount window, and the Fed strong-arms investment banks into participating in Freddie Mac's $3 billion debt auction tomorrow. Second, the Treasury gets Congress to amend the housing bill to include provisions allowing the Treasury to extend their line of credit to the GSEs and to buy equity in the GSEs if necessary. The first prong, they hope, will buy them enough time to complete the second prong. I'm not wild about this plan at all. Seeking Congressional approval for any sort of time-sensitive rescue is a mistake. Worse, the way they're seeking Congressional approval is potentially suicidal. They want Congress to include the provisions in the housing bill, which has not only been quite controversial, and which the Senate has already passed. They would probably have to open the bill back up, which, as the WSJ story recognizes, would probably necessitate further debate. I'm not too confident that Congress can or will get this done quickly. I remember the Mexican peso crisis and the fight over the Mexico bailout all too well, and it's possible that a similar fight could break out in Congress over the GSE bailout plan. The Treasury eeked out a win in the 1994 Mexico bailout, and if Congress resists the GSE bailout plan, the Treasury might not win this time around. And that would have severe consequences in the financial markets. From Bob Litan at Growthology: Subprime mortgages as a percentage of total mortgage originations was relatively constant through 2003, and didn't start to grow until 2004. Subprime mortgages didn't really take off until 2005-2006. Now compare this to a chart of the housing bubble: So as everyone should know by now, the housing bubble wasn't the same thing as the subprime crisis. Raise funds for economic research. The declining liquidity of the physical base of the reference crudes and the narrowness of the spot market has caused many oil-exporting and oil-consuming countries to look for an alternative market to derive the price of the reference crude. The alternative was found in the futures market. Easing up on speculators might win the votes of most economists, but that doesn't necessarily mean that those economists have any clue what they're talking about. US TREASURY secretary Hank Paulson is working on plans to inject up to $15 billion (£7.5 billion) of capital into Fannie Mae and Freddie Mac to stem the crisis at America’s biggest mortgage firms. ... The capital-injection plan is said to be high on a list of options being considered by regulators as a means of restoring confidence in the lenders. The move would protect the American housing market, but punish shareholders in both companies. Under the terms of the proposed move, the US government would receive a new class of shares in exchange for the capital, which would be hugely dilutive to shareholders. And let us not kid ourselves: this is a fig leaf, not a solution. This move would acknowledge that the GSEs are undercapitlized without giving them enough equity to function as independent, self-supporting financial institutions. It affirms the implicit guarantee without formalizing it. I'm not as hostile to Paulson's plan as Smith. She thinks a $15 billion capital injection isn't enough to adequately capitalize the GSEs, and that the plan therefore amounts to a half-measure. I think the questions about Fannie and Freddie's solvency are a bit over-blown -- as Richard Green noted, the last real news about Freddie Mac came out more than 2 weeks ago, and it wasn't that bad. If Paulson and Bernanke (who I assume is intimately involved in the planning) are satisfied that the GSEs aren't dangerously undercapitalized, then what they need to do now is calm the markets at the lowest cost. I don't know if that's the aim, but that's my guess. Is $15 billion enough to calm the markets? I don't know that either, but I'd say it probably is. We shall soon see. The media keep resurrecting the faux-controversy over McCain's eligibility to be president. The Constitution provides that only a "natural born Citizen, or a Citizen of the United States, at the time of the Adoption of this Constitution, shall be eligible to the Office of President." The issue is whether McCain, who was born in the Panama Canal Zone and whose parents were both U.S. citizens, is a "natural born citizen." At first, I imagine someone whispered in a journalist's ear that McCain isn't eligible to be president. It was a juicy story, and it definitely got a lot of attention initially. But then legal experts pointed out that it's a preposterous argument, and the story faded away. Then some random law professor wrote an article arguing that McCain may not be eligible after all(! ), and it was off to the races again. Again assured by legal experts that the argument is ridiculous, and that McCain is indeed constitutionally eligible, the media backed off. But now the New York Times has unearthed another law professor willing to argue that McCain isn't eligible to be president, and is running a story under the headline, "A Hint of New Life to a McCain Birth Issue." The NYT even calls it "the most detailed examination yet of Senator John McCain’s eligibility to be president" to add some superficial credibility. Jim Lindgren of the Volokh Conspiracy provided a good smackdown of the crazy argument that McCain isn't eligible, noting that the concept of a "natural-born citizen" was very well known at the time the Constitution was adopted, and it most certainly includes children of U.S. citizens born abroad. When will the media stop reviving this faux-controversy? Probably when pigs fly. The two giant GSEs, Fannie Mae and Freddie Mac, have long imposed an externality on the public. We're now feeling that externality. Fannie and Freddie's primary purpose is mortgage securitization, but they also issue debt to finance their own portfolios of mortgages and mortgage-backed securities (MBS). As the mortgage market has frozen up, Fannie and Freddie have been securitizing mortgages less, and buying mortgages and MBS more. Together they now own or guarantee about $5.3 trillion in mortgage debt, which, according to the FT, is "equivalent to the entire publicly held debt of the US government." The implicit government guarantee of Fannie and Freddie's debt allows them to borrow at artificially low interest rates—the current spread on Fannie's 2-year bonds is considered incredibly high at 74 basis points, but that's still over 20 basis points lower than the current 2-year swap spread, which is 95.5 basis points. This gives Fannie and Freddie an incentive to take on excessive risk in their mortgage portfolios. Buying risky MBS increases the chances that Fannie and/or Freddie will default, and because the government would likely step in to prevent a default, the taxpayers are bearing the costs of Fannie and Freddie's excessive risk. In short, the implicit government guarantee creates a classic externality. How large is the externality? In theory, the size of the externality equals the difference between Fannie and Freddie's artificially low borrowing costs and the borrowing costs they would be paying in the absence of an implicit government guarantee. In practice, however, the size of the externality is more difficult to measure, because there's no way of knowing what their borrowing costs would be in the absence of an implicit government guarantee. Given that Fannie and Freddie have been buying far more subprime securities—and mortgage-backed securities in general—than anyone in the market, it's fair to say that their borrowing costs would be higher than the borrowing costs for other seemingly comparable investors. It's also difficult to determine whether and how much Fannie and Freddie's possible insolvency—and the systemic risks their insolvency poses to the financial markets—are driving up other banks' current borrowing costs. At this point, removing the implicit government guarantee wouldn't cause Fannie and Freddie to fully internalize the costs of their possible failure, because the implicit guarantee has already allowed them to grow so large that their failure poses systemic risks. One externality begets another externality, it seems.